The sad thing is I run in to a lot of people in the Christian universe who are just as susceptible to stupid mind tricks. Instead of a Jedi waving his hand around, the devil makes simple and repeated suggestions and believers, failing to reflect on the source and content of what they heard, buy in to and act on those suggestions to their destruction. This confusion is a device of the enemy to introduce deception through multiple or contradictory voices that distort God’s voice or drown it out. What’s amazing is how open God’s people are today to the distortion of the enemy – even people who have been trained to know better. Gehazi, the protege of Elisha and prophet in training, accepted the thought of the evil one that he knew better than his master, and Naaman should have to pay for the supernatural healing he received from God. Instead of rejecting the contradictory word, Gehazi was moved by the stupid devil mind trick, received clothes and money from the recently healed leper, was exposed by the prophet Elisha, and was consequently stricken by leprosy. Gehazi, the servant of Elisha, the servant of Elijah, stood to walk in an anointing even more powerful than Elisha or Elijah, but lost everything because he acted on a stupid devil mind trick. The cost for believers is just as high today. Acting on the stupid devil trick causes separation – separation from our faith community and family, separation from our destiny, separation from vital relationships, separation from our blessing, separation from our anointing, separation from our covering of protection and wisdom, and separation from our inheritance (spiritual and natural). The simple suggestion of the enemy is responsible for countless believers failing to walk in and experience God’s best. Sadder still, the devil convinces believers they are perfectly justified and right to act on the stupid devil mind trick. Imagine carrying out the agenda of the enemy convinced it’s Gods will (John 16:2). God’s people are truly destroyed for a lack of knowledge (Hosea 4:6). Gehazi’s story reminds us the stupid trick works on seasoned leaders as well as babies in the faith. The good news is the confusion of the enemy caused by stupid devil mind tricks can be overcome. First, you can defeat the deception by laying a foundation for clarity in your life by saturating your mind daily with the Word of God. The best way to tell a counterfeit thought is to be immersed in the truth of the thoughts of God (Romans 12:1-2). We can’t identify the will of God (what is true) until we offer up our bodies as living sacrifices and transform our thinking by the the Word of God. Second, test or challenge everything you think you hear following the admonition of Paul to hold on to only that which is true (1 Thessalonians 5:21). It’s comical how many people mindlessly repeat or repost things they found on Facebook or other social media. Just because we saw it or heard it does not make it true. We need to be especially sensitive to the suggestions of the enemy. Third, close the door to confusion by ridding your life of envy and strife, “For where envying and strife is, there is confusion and every evil work” (James 3:16, KJV). We are predisposed to the deception of the enemy when we are envious of others or have entered in to strife. These things always produce confusion and help to explain how good Christian people can become destructive forces in their families, churches, and places of work. Fourth, become Spirit led instead of emotion driven (Romans 8:14). Too often, when we hear something, including the lie from the stupid devil mind trick, we have an emotional reaction before we evaluate the thought biblically. Emotion ruled living intoxicates the believer, and much like the drunk driver, impairs the believer’s judgement and responses. We need to make decisions from a position of spiritual peace instead of emotional intoxication. Finally, submit what you think you heard to spiritual leadership early in the process for there is wisdom in a multitude of counselors (Proverbs 15:22). Godly leaders are anointed to sniff out the stupid devil mind trick and deception but the believer must submit the situation to leaders early and quickly instead of coming to them just to inform them of what they have already decided. The time is short and the stakes are very high. Don’t be like the weak minded stormtrooper easily duped by the Jedi, but become strong in mind able to identity and reject the stupid devil mind tricks that come against your mind. We simply can’t afford to lose any more Gehazis to the dark side. Transitions are a fact of life. In our highly mobile society, it’s not uncommon for people to change jobs, houses, associations, schools, churches, and geographical locations. While the Lord does lead his people into seasons of life change from time to time, I’ve noticed that some people seem to be literally addicted to change, making sweeping, compulsive, and often irrational life-changing decisions over and over again. I call that pressure to change things or to shake things up repeatedly the itch and I’ve realized after many years of spiritual leadership that the itch is actually a form of addiction and life-controlling problem, rather than merely flightiness or flakiness. Rooted in a failure to develop biblical contentment, the individual with the itch addiction lives with a constant nagging sense that the thing they need the most and the thing they seemingly must have to function is right around the corner. So on a dime, and without thought of consequences or openness to sound counsel, they veer off to scratch the itch. Rationalizing each move, they literally pull themselves and often their families all over the map trying to soothe the itch. Wisdom is proven right by her actions (Matthew 11:19), and too often, the decision is proven to be yet another mistake. Why? The change was itch mandated rather than Holy Spirit directed. The problem with the itch is that it prevents individuals from ever developing a root system, and since there is no root there can be no real fruit. Just about the time the Lord gets us into position to begin to lay a foundation for great growth, the enemy comes along and inflames the itch. Itch addicts, consequently, postpone their development, compromise their destiny, and squander valuable time and resources with each knee jerk decision. The itch is complicated by well-meaning but undiscerning individuals who actually praise or encourage this behavior under the guise of wanting to be supportive. We should no more encourage someone with the itch to swerve than we would an alcoholic to get a bottle and get drunk. The veer is the itch addict’s drug of choice and they need gentle instruction, the renewing of the mind, deliverance, and accountability, rather than enablement. When we truly care about the addict, we help them face reality instead of empowering them to remain addicted. If you are given to the habit of repeatedly veering and swerving from one place to another, don’t look to justify the behavior, garner support from others for the addiction, or attack the messenger (as so many substance addicts do). Acknowledge, confess, and repent over the fundamental lack of contentment in your life, and for letting the itch run your life. Tell the itch it can no longer be the Lord over your life. Learn to stay still and wait on the Lord. Changes will come into all of our lives, but we need the Holy Spirit, not the itch, prompting those changes. More and more believers, it seems to me, appear to be lost in life. By “lost” I don’t mean that they are unsaved or backslidden. I mean they seem to have lost their sense of direction caught off guard by some storm or fog that quickly rolled into their lives and disoriented them. By lost I mean they feel they have lost their way or their purpose. They are perplexed and bewildered feeling like they are in a maze, uncertain how to get out and back on the right path. Believers lost in a fog without vision are in danger of compromising their destination, bankrupting their faith, and leading other Christians astray. I remember going to the dime store with my mom as a five year-old kid back in Illinois. It’s amazing how big everything looked through the eyes of a child. The store, though small, was large enough for me to quickly lose track of my mom as she turned the corner with shopping cart in front of her to check out some special in the store. I remember momentarily being gripped in a fog of fear as I lost site of her only to glance above the shelf line to see her blond hair bobbing down the aisle. That 1960’s hairdo became a beacon of hope to help a little boy to get back where he belonged. There are many reasons why believers get lost in the fog of life. Some believers run with the wrong crowd and follow that crowd off the path. Some believers allow a root of bitterness to spring up in their hearts and that root will defile many, according to Scripture, but it starts by deceiving and sidetracking the ones who harbor it in their hearts. Some believers simply take a wrong turn in life. They are not bad people but it only takes one bad turn in life to get off track. Some believers succumb to the intensified level of spiritual warfare in the world today and the central mission of that war is to distract and cut off believers from their destiny. Some believers get isolated from God and stop seeking Him and in doing so also lose the direction that His presence automatically provides. Still other believers falter because of burn out or because of major setbacks, failures, or disappointments. Regardless of the reason, the Lord wants you to know that no matter how thick the fog, no matter how far you have strayed, He is ready to turn the light on and help you find your way back. Proverbs 4:18-19 tells us that the path of the righteous, unlike the path of the wicked, gets brighter and brighter. This means that God’s best and the norm for the believer is to walk a path that is clear and obvious. 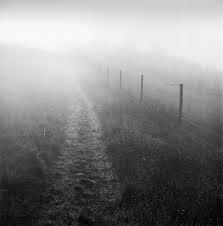 When we are in a fog, that path gets dimmer and dimmer. The good news is there are some practical things you can do to navigate through the fog and get back on God’s best path for your life. First, turn on the light. In other words open that Bible up again and begin to draw from the wisdom and apply its light to your path (Psalm 119:105). Second, back track to what you were doing when you got lost in the fog. There is usually a critical signal you missed or some juncture where you stepped off the path and into the fog. No matter how painful, have the courage to admit that you missed it because God gives grace to the humble (2 Peter 5:5). There’s nothing sadder than to see a fog bound believer more interested in protecting their image of infallibility than getting their life back on track. Third, reach out for a “seeing eye” Christian. It does you no good to seek counsel from another Christian that is also lost in the fog. Seek advice from a believer that is walking in the light and can tell you what you need to do to get out of the fog. Fourth, Pull away with God by yourself for a time of serious reflection, prayer, and study. Remember the Lord loves to answer prayers for wisdom and guidance (James 1). Fifth, listen for the voice of the true shepherd and tune out other competing voices. The Bible (John 10:27) declares that God’s sheep know his voice. Psalm 119:176 says, “I have strayed like a lost sheep. Seek your servant.” Like the Psalmist, invite the shepherd to venture into the fog of your life and rescue you. Finally, to keep from making the fog worse, postpone decisions that affect other people until you know you are back on the right path. Too often, believers in desperation make matters worse by trying in the flesh to make something happen. Too often, those believers end up pulling family and friends into the fog with them rather than walking out into the sunshine of God’s grace together. Something told me Albert Pujols would not be returning to St. Louis when the dust finally settled in the free agent bidding war that would surely follow the 2011 baseball postseason. Sure, I really got tired of hearing the sportscasters say over and over again, “this may be the last time we see Albert in a Cardinal jersey.” But in my heart I knew, despite the amazing wildcard comeback, division championship, league championship, and World Series bid, when this season and postseason were over, Pujols would be leaving. That’s why I feel especially blessed to have been able to attend game seven of the World Series with my son Tim to see St.Louis win it all and watch Pujols play his final game for St. Louis. Now we know that Pujols will be playing with the Angels having managed to land the elusive ten-year contract with a no trade clause (he stood to make millions no matter where he landed). Angel fans are pinching themselves and Card fans are in shock. At a time like this the throngs of Cardinal nation will begin to vilify the front office for their failure to sign Pujols or lash out at Sir Albert for abandoning baseball heaven for the City of Angels. But there is something more fundamental at play here than just contracts, money, and sports politics – a man’s sense of God’s path and plan for his life. In my lifetime I cannot remember hearing about a top shelf athlete in any sport actually spending a sleepless night seeking God’s will for the next season of his life. 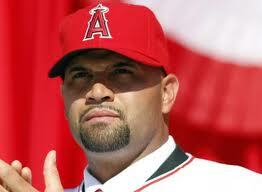 By 7:30 a.m. the morning of his decision Pujols was quoted as saying that the Angels were tugging on his heart and that he believed God was leading him to make the move to Anaheim. The Bible says that “the steps of a righteous man are ordered of the Lord” (Psalm 37:23). The Scripture speaks of the path as something that gets brighter and brighter for the righteous and darker and darker for the wicked (Proverbs 4:18). These eternal principles apply even to ballplayers even if the fans don’t like where that path is leading. The pundits will say it was all about the money. The sour fans will bellyache about being betrayed by his decision. But as for me, a lifelong Cards fan and spiritual leader, I am encouraged by yet another example of Sir Albert’s firm conviction to glorify God with his life. Sure the sportswriters will moan about how he is not the greatest at fan interaction and they tire about hearing of his commitment to charities that support mentally and physically challenged children, but he has proven time and time again that he lives by a consistent set of Christian values that everyone should honor and appreciate. May more Christians be so bold as to remember they are on this earth to do God’s will and honor Him wherever His path in life takes us. In the end, it does matter where we do what we do. Albert seems to get this very critical Kingdom principle even though many Cards fans and many believers do not. So whenever I get the chance to see Sir Albert play on television on the rare occasion live in an American League ballpark, I’ll be cheering for the man of God more than for the Angel in the infield. He is more of a hero to me today than any time I had the privilege of seeing him wear the Cardinal red. Well played Sir Albert. It’s that time of the year. You know what I’m talking about. We get all fired up and motivated to change the world and decide to start with ourselves. Every wellness center and health club operator can tell you that the worst time to join the gym is the first couple of weeks in January when the resolution crowd pops in for their few days of exercise for the year. They’ll also tell you to just wait a few weeks. The masses will clear out just as fast as they came in. First, a quality decision is limited in scope. It’s impossible to fight on multiple fronts and expect success. It’s probably not a good idea to try to recover your high school weight, change your career, meet someone and get married, up your level of education, quit smoking, stop gossiping, become the next Billy Graham or Joyce Meyer, and get delivered from wii all in the same year. We need to limit our changes to 1-2 key areas and focus our faith and energy on bringing them to pass this year. It’s better to have victory in one or two areas than to experience defeat in ten areas. Second, a quality decision is Word-based. John 1 tells us that in the beginning was the Word and that the Word was God and with God. This powerful truth that reveals the nature and eternity of Jesus Christ also reveals a very important life principle. If we are going to start anything in life, start or begin it with the Word. Find the place in the Bible where that area is discussed. You’ll be surprised how many life issues and challenges are actually addressed directly in the Word of God. Why is this so important? Because you need to approach substantial life change with faith in your heart and we know that faith comes by hearing and hearing by the Word of God. When you feel like quitting, the Word that has the power to bring itself to pass in your life will spur you on. Third, it is the action that separates the intentions of the resolution from the results of the quality decision. If you are truly serious this year and want to make the change you’ll need to understand that quality decisions require diligent action. The individual making the resolution may initially exert some energy or action in the direction of the resolution, but more often than not the enthusiasm wanes and he or she just drops the ball. Quality decisions require diligence and diligence is steady application toward any endeavor. It is constant effort exerted to accomplish something. Notice that diligence is continuing to work toward the goal day in and day out regardless of feelings or pronounced change. Finally, a quality decision is one from which there is no retreat. You begin the journey with the mindset that quitting or throwing down the goal is not a possibility. A mindset (the resolution mindset) that says I may or may not complete this goal is doomed to failure from the beginning. You have to decide from the very beginning that you are going to see this thing through to the end regardless of the nature of the decision. If you limit the scope of the decision, base the decision on the Word, apply diligent action, and make up your mind that retreat is not an option, you’ll find yourself changed by this time next year.